In all seriousness though; let's talk Jane Austen spinoffs. Cry until you are blue in the face, Jane-ites, it isn't going to stop these getting written or published, despite the idea being removed from fan fiction only in name. It's undeniable-- these Jane Austen revisitation novels appear to be cash cows. Which means they'll be coming off the presses for years to come, so either get used to it, or learn to live with it my dears, because guess what? No one is going to press a gun to your head and force you to read one of them. I was appalled by the idea too. What? I thought to myself. They expect me to read a modern updating of Sense and Sensibility written by a woman whose novels are widely regarded as commercial women's fiction (horrible label, I know), which boldly mentions Facebook on the back cover? Egads. But the thing is, I was also curious. And so I read the first chapter and found myself ensconced. We know the story. Elinor and Marianne Dashwood are two sisters who couldn't be more unalike, both lovely, who live with their recently widowed and slightly... erm... incompetent mother and their younger sister. They are thrown out of their home as a matter of inheritance, and move to Devon, and the whole thing turns into a comedy of errors but with fainting and trips to London. And witty dialogue. And love. The modern updating of the story is a part of the Austen Project, which you can read about here - and is very much a celebration of Jane Austen's contribution to the worlds of booklover's worldwide. Her classic characters and plots slip neatly and unputtdownably into the modern age. If you were severely let down by the latest Bridget Jones 'adventure' then perhaps this will be more your cup of tea. 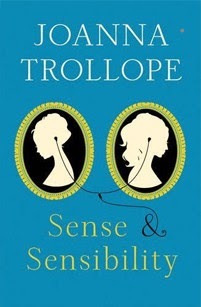 In Trollope's version, Elinor is an architecture student and Marianne a sensitive musician. They still find themselves surrounded by the aristocracy, albeit now rather outmoded and slyly poked fun at, and hilarity ensues as their little English Country village- aided by Facebook and Twitter, and texting and Youtube- ties itself up in knots. Admittedly, some of the crucial things about Regency England must be stretched for the plot still to work; laws of inheritance for example, and class barriers; but this book is so entertaining that I hardly minded. I found myself wincing at the biting cruelty of Fanny and John Dashwood, cringing at the inanity of Mary Middleton, and cheering for Edward and Elinor, although I still felt, as I did in the original, that making Lucy Steele run off with Robert Ferrars was a bit of a deus ex machina. Don't get me wrong. This book is not perfect. You will encounter Nancy Steele talking like a cross between a Brooklyn Gangster and a cast member from The Only Way Is Essex, and if that's not enough, you'll find even Marianne's namby pamby emotional stuff trying at times (I mean, come on, it is the 21st century... I know you have asthma and your boyfriend left you but please grow up!) I also felt that while Trollope tried to minimise it, the age difference between Colonel Brandon and Marianne was more inappropriate now in a modern updating, and I would have perhaps liked to have seen a more realistic change in the ending- maybe this would have been a nice opportunity to try out the ending suggested in Jane Austen Book Club and set up Brandon with Mrs Dashwood. I mean why does Marianne need to settle in the end at all? I think she needs to learn to be alone for a while... and get a job and stop letting Elinor do everything just because she's the pretty, delicate one. Sigh. Rant against wilting lilies over. For now. If you're looking for a great beach read, you've found it, but be warned. This is Jane Austen-lite, Austen for the Austen lover looking to be reminded that the things Jane teaches never go out of style.